I think these are all brushless shaving creams, although I didn't try them with a brush. I used each only once. 1. Neutrogena Sensitive Skin 150ml (5.1 fl. oz.). Retails at Amazon for $6.96. 2. Pierre Cardin Precision 113g (4 oz.). Vintage, no longer available retail, but it sells on eBay for $14.95. 3. Avon Wild Country 113g (4 oz.). Vintage, no longer available retail, probably sold for $5-7. Last edited by churchilllafemme on Sat Mar 11, 2017 7:41 pm, edited 5 times in total. 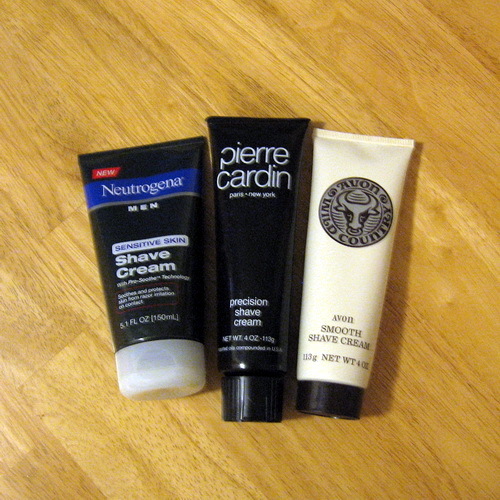 Real Pierre Cardin was discontinued years ago. The label on ebay is not old stock. I got a tube of their shave balm to check the scent. Close but not the real thing.